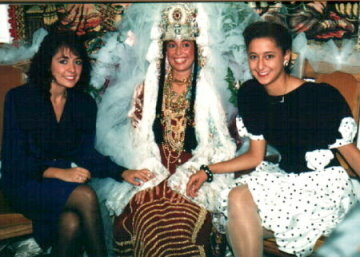 A Moroccan Henna or "Beberiska"
A Henna is a traditional ceremony performed for the bride prior to the wedding ceremony. 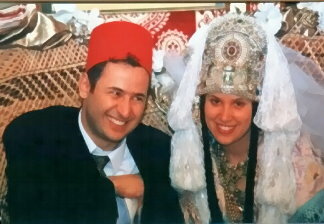 In actuality, it WAS the wedding ceremony in the arab lands some 200+ years ago. 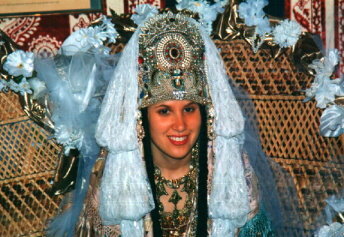 Today, we continue the tradition in dressing the bride, singing ancient songs, and annointing the palm of guests with a unique smear called the "Henna". 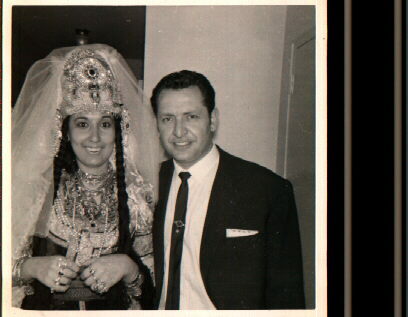 Picture taken in Mid 60's of the Wedding of Avraham Pinto to Esther Bitton. Today Esther Pinto is one of the select few Moroccan women who has sewn her own Henna dress (Bestido) and has volunteered the dress & her service to the Moroccan community in the geater Toronto, Canada region. Send an e-mail to include your name and phone number, if you would like to have a Henna performed for a friend or family member getting married soon. Ishoa Estrella translates to "Star"
Mesod Perla translates to "Pearl"
Tamito Sol Sol means "Sun"
Amran Luna Luna means "Moon"
Habib Biba Biba means "Life"
Simha(Simy) probably from the root of "Simcha"
Sephardic Genealogy Great source of information on Sephardic Jewish Names. What are the Origins of Mimuna? The seventh night of Pessah (the eighth day in the Diaspora), while most of the communities of Israel bid farewell to the holiday, Sephardic Jews from North Africa continue to rejoice, in celebration of the Mimuna.